This apartment provided all anyone would need for a perfect travel getaway. It was spacious, spotless, and private, with a patio overlooking a small park area. It was also conveniently located near a tram stop and within a half mile distance of the Basel SBB. Karen, the gracious and helpful property owner, treated my husband and me as personal friends. If you are looking for the ideal apartment to rent in Basel, this is it. Free parking in the garage. Nice bathroom with shower. Quiet area close to the city centre. The apartment was very clean and well-equipped with a useful kitchen. Plenty of space and also offering a parking space if you are travelling by car. Karen, the host was very nice with us and very helpful. The apartment was perfect!The layout was great!The lighting was excellent and the WiFi seamless. Wunderschöne Wohnung in ruhiger Lage, in schönem Park, mit eigenem Gartensitzplatz. Wohnung sehr schick eingerichtet und dekoriert. Sehr empfehlenswert. Отличные апартаменты, есть все необходимое для жизни. Недалеко от центрального вокзала, трамвай в шаговой доступности. Рядом несколько супермаркетов. Gute Lage, zentral und doch ruhig. Naher öV. Eigener Parkplatz vorhanden. Waschmaschine und Trockner zum benutzen. Die Wohnung ist sehr schön, sauber und hat alles was man braucht! Karen ist sehr nett. Lock in a great price for 2,5 Zi Design Loft Wohnung mit Gartensitzplatz – rated 9.7 by recent guests! 2,5 Zi Design Loft Wohnung mit Gartensitzplatz, a property with a garden and a terrace, is set in Basel. Guests staying at this apartment have access to free WiFi. The apartment has 1 bedroom, a kitchen with a dining area and a dishwasher, and a bathroom. A flat-screen TV is provided. The property offers a private park. The Museum of Arts Basel and the pedestrian area can be reached in a 10-minute ride by public transport. Architectural Museum is 0.7 mi from the apartment, while Zoological Garden is 0.8 mi away. The nearest airport is Airport Basel Mullhouse, 7.9 mi from 2,5 Zi Design Loft Wohnung mit Gartensitzplatz. 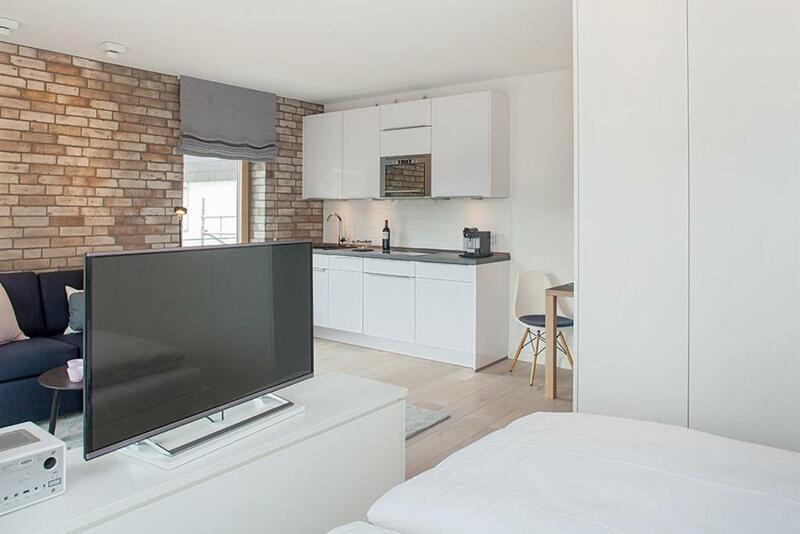 When would you like to stay at 2,5 Zi Design Loft Wohnung mit Gartensitzplatz? House Rules 2,5 Zi Design Loft Wohnung mit Gartensitzplatz takes special requests – add in the next step! Please inform 2,5 Zi Design Loft Wohnung mit Gartensitzplatz of your expected arrival time in advance. You can use the Special Requests box when booking, or contact the property directly using the contact details in your confirmation.